A series of gas explosions an official described as "Armageddon" ignited dozens of fires across three communities north of Boston, killed at least one person and forced entire neighborhoods in the Merrimack Valley to evacuate Thursday. Authorities said Leonel Rondon, 18, of Lawrence, died after a chimney toppled by an exploding house crashed into his car. He was rushed to a Boston hospital but pronounced dead later in the evening. More than 20 others were treated for fire-related injuries. Firefighters raced from one blaze to another, scrambling to fight flames engulfing homes in Andover, North Andover and Lawrence while utility crews rushed to shut off gas and electricity. "I've been in the fire service for almost 39 years and I've never seen anything like this in my entire career," Andover Fire Chief Michael Mansfield said at a Thursday night news conference. "It looked like Armageddon, it really did. There were billows of smoke coming from Lawrence behind me. I could see plumes of smoke in front of me from Andover. It just looked like an absolute war zone. It's something I've never experienced in my fire service career and I hope I never experience it again." The Massachusetts Emergency Management Agency suspected the explosions were caused by an "over-pressurization of a gas main" belonging to Columbia Gas of Massachusetts, which services the area, but officials who responded to the area were still investigating what happened. "This is still a very active scene," Gov. Charlie Baker said. "There will be plenty of time later tonight, tomorrow morning and into the next day to do some of the work around determining exactly what happened and why." Aerial footage of the area from NBC10 Boston's helicopter showed smoke billowing from several houses while firefighters battled massive flames at others, and some homes that appeared to have been torn apart by blasts. In Lawrence, a man whose neighborhood was among dozens that erupted in fire said he ran into his basement to find that the room was glowing. Resident Ra Nam says he was in his yard when the smoke detector in his basement went off around 4:30 p.m. Thursday. When he ran downstairs and saw the boiler was on fire, he quickly grabbed a fire extinguisher and put it out. Minutes later, Nam said he heard a loud boom come from his neighbor's house and the ground shook. Nam said a woman and two kids had made it out of the house, but the basement was on fire. North Andover Selectman Phil Decologero said his entire neighborhood gathered in the street, afraid to enter their homes. 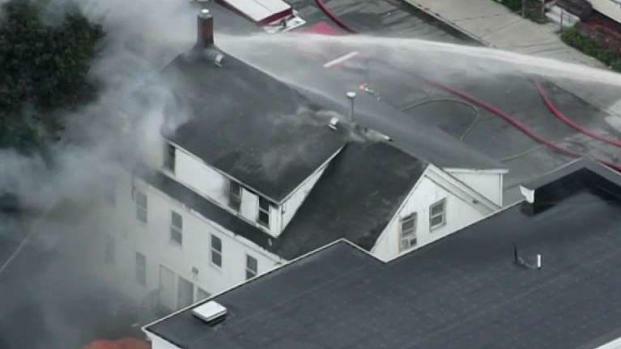 Massachusetts State Police said some 70 fires, explosions or investigations of gas odor had been reported. Andover officials said firefighters responded to 38 blazes across town. Joseph Solomon, the police chief in nearby Methuen, said 20 to 25 homes were on fire in Lawrence. Solomon, who responded to Lawrence to help, said there were so many fires "you can't even see the sky." Another 12 to 14 fires were reported in North Andover, Town Manager Andrew Maylor said. State police urged all residents in the three towns with homes serviced by Columbia Gas to evacuate Thursday afternoon, snarling traffic and causing widespread confusion as residents and local officials struggled to understand what was happening. More than 100 people, many of them senior citizens, checked into the North Andover High School Thursday evening after a series of gas blasts forced entire neighborhoods in three Massachusetts towns to evacuate. NBC Boston's Jonathan Choe reports. Schools in all three communities were canceled for Friday, and some schools were being used as shelters for residents. The Red Cross of Massachusetts was helming relief efforts for evacuees. Officials said anyone looking to donate supplies, volunteer or make a monetary contribution can visit the redcross.org. Andover residents who live on the North Reading side of town were allowed to return home shortly after midnight. Officials from all three towns said there is no timeframe yet for when other residents might be allowed to return to their homes. Over 70 homes in Lawrence, Massachusetts went up in flames following an explosion from a gas line. It is believed that the explosion was caused by an overpressurized gas line. "This has obviously been an incredibly difficult day," Gov. Baker said. "At this time I ask everyone to think of the family who lost a loved one today and to pray for everyone who has been injured." Many businesses closed as a precaution due to the fires, but McAloon's Liquors in North Andover was still open as of 8 p.m. Owner Bill Buco said he would stay open until police told him to close. There were long lines for essentials like water. "My customers need service. They need water, they need milk, they need bread," he said. Baker said state and local police would patrol the three communities overnight and officers were stationed at intersections directing traffic. "My heart goes out to the families in Lawrence, Andover and North Andover who are trying to pick up the pieces after dozens of fires & gas explosions in the area," U.S. Sen. Elizabeth Warren said in a tweet Thursday. "Grateful to all our first responders working to help. Massachusetts is strong - we will recover & rebuild." At an early morning news conference on Friday, Massachusetts Gov. Charlie Baker said he told Columbia Gas that it must bring in additional resources and develop a comprehensive safety plan for for each of the communities affected by the gas-related explosions in the Merrimack Valley. Hours after the explosions, Columbia Gas' parent company issued a brief statement saying its crews were still performing safety checks in the area. Gov. Baker said he told the utility company that it must bring in additional resources and develop a safety plan for each of the communities. Early Friday, the utility issued a statement saying its crews need to visit each of the 8,600 affected customers to shut off each gas meter and conduct a safety inspection. "Additional support is being provided by crews from several affiliated Columbia Gas companies and other utilities," the statement said. "We expect this will be an extended restoration effort, and we will work tirelessly to restore service to the affected customers." Emergency crews responded to reports of multiple explosions and fires in Lawrence and North Andover, Massachusetts on Thursday afternoon. The blasts caused widespread disruption through the northeastern part of the state. The MBTA suspended train service on the Haverhill line north of the North Wilmington Station. Friday's commuter rail service on the Haverhill line is scheduled to operate only between North Station and Reading Station. The agency said shuttle buses would be available at the Haverhill and Bradford stations to take passengers to the Anderson-Woburn Station on the Lowell commuter rail line. The Amtrak Downeaster canceled several trains Thursday during the evening commute due to the fire department activity in the area. All off-ramps on Interstate 495 from exits 41 through 45 were shut down Thursday and remained closed as of 6 a.m. Friday morning. Exit 45 reopened. On ramps remained open to allow for evacuations. The northbound and southbound ramp for Exit 45 on Interstate 93 was also closed Thursday and remained closed Friday morning, the Massachusetts Department of Transportation said. "The @CityOfBoston is here for the people of Andover, North Andover, and Lawrence tonight," Boston Mayor Marty Walsh tweeted. "I thank all of our first responders, including @BostonFire & @bostonpolice who are working hard with many others to keep everyone safe."